"On an epic quest to find you're neighbours kitty cat!" Publisher: Team 17 Developer: Tiger & Squid Players: 1 Genre: Adventure Launch Date: August 4th, 2015 Price: £9.99 Indie developers of recent years have been creating small studios to try to take on creating often ambitious but different titles to help break the mold from the influx of third and first person shooters we have seen over the past couple of years. Developers Tiger & Squid are no different, they have devised a unique tale involving a young blind girls journey to try to follow her feline friend through different areas whilst painting various areas in color to try to capture the imagination she would be going through in her dark world and scary world. Question is…is the game any good or should it have stayed in the dark? Gameplay – 4/10 Straight from the bat I want to point out that Beyond Eyes is incredibly short on gameplay and actual structure for that point. You start you’re tale playing as a girl named Rae who is involved in a freak accident involving a fireworks display that unfortunately blinds her. With her world cast into darkness and feeling scared and alone, she sits at home day after day until a furry friend called Nani comes to befriend Rae for the summer before taking off on other ventures. As soon as you’re furry comrade departs to play catch with the birds, Rae decides to pluck up the courage and try to locate Nani so that she can be happy and relive those happy moments that she had since the accident. 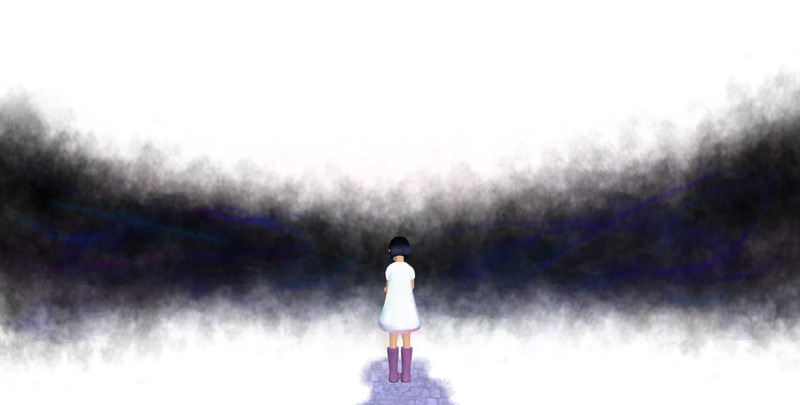 The story which takes place over six different stages is pretty bare, the game comprises of you walking around the stage which begins in a white hue, the further you travel the more of the map you start to reveal. You’re objective isn’t exactly always clear, sometimes just walking up to specific objects will move you onto the next step of the story such as interacting with traffic lights in the second chapter, but more often than not whilst wondering around you will come across visions of Nani which will either try to help move you into the right direction or progress the story bit by bit. The walking pace which the game dictates for you is pretty slow, but this also plays in part to making the character of Rae more believable, for a blind girl you cannot have her running around bumping into everything in sight, however sometimes whilst wondering I would get stuck on pieces of scenery or places where scenery would start to clip in. When the route forward looked clear it could get frustrating having to inch you’re way around objects to move forward. One pretty interesting mechanic that is featured within the game though is, when Rae comes across something that scares her, the games character model immediately changes and the color palette of the game loses some of it’s vibrancy to indicate danger and to try to avoid it or find a way to overcome the obstacle. Graphics - 7/10 Graphically Beyond Eyes is a pretty title to look at, with each stage setting a blank palette for you to explore and maneuver around, it was nice to see so many colors included in the game. However the character models leave a lot to be desired, framework and facial animations look like they could easily have ran on a console from two generations ago. For a game with not a whole lot going on within it, the drawer distance of the obstacles seemed to be rather short, I was sometimes left wondering if this was just a way to show off the ability that Rae needs to be near to things to listen to objects around her and use her imagination to drawer up conclusions on what is around her. But for areas previously explored you still found the areas to gradually come into and out of view. Like previously mentioned in the last segment it was also nice to see how the color palette would get a shade or two darker whenever threats were nearby and to show and indicate the danger Rae knew she would be in. Each different area of the game tries to mix up the locations also and add a little bit of different variety so you are not always looking at the same thing, from train yards to cemeteries everything looked nicely animated with no clipping issues to detect. Why did the chicken cross the bridge? To get me an achievement of course! Sound - 4/10 Some of the music within Beyond Eyes is nice to listen to, occasionally when progressing through the story you get met with orchestral scores, but these are only in short bursts and are few and far between. For the majority of the title you will be walking around in silence or listening to the wildlife that will be going on around you, for a title where the whole purpose is to listen to you’re surroundings and make up a picture of what you’re surroundings may look like, their isn’t a whole lot going on. Voice acting is pretty limited within the title, and one of my major gripes was you will sometimes be given audio que’s with an npc saying over there to try to help you locate something. However the over there isn’t really used to help direct you, all it ends up doing is frustrating you whilst you try to locate what it is you need to interact with. Achievements - 2/10 Beyond Eyes contains a mere ten achievements, and with those ten only one of them isn’t missable. The rest of the list contains achievements for interacting with certain objects or for collecting items. If you are looking for a pretty simple completion to put onto you’re gamertag then this is probably a good title to use for that, to gain everything will probably take you around two to three hours with a good guide. To help pad out the list a little more though it would have been nice to have gotten an achievement for getting through each chapter to help people progress onward. A fairly lackluster list in all honesty, but it is hard to see how the developers could of rewarded gamers any differently with the very little you can do during you’re time with Rae.